The New York Jets continue to #SuckForSam, falling to 0-6 on the season without any hope of a win. The run game hasn’t produced at all, Christian Hackenberg came in early in the year and couldn’t move the offense and the defense has been an absolute sieve. Overall, this team looks likes it’s given up on winning entirely this season, resigning themselves to a 0-16 campaign for one of the many quarterbacks having predictably outstanding college football seasons. The Jets are 3-3? They’re only one game back for the lead in AFC East? Oh. One of the reasons for the Jets success this year has been the run game. They’re averaging just under 4.3 yards per carry through 6 weeks of the season, and watching their film they have a plethora of designs and schemes they use to move the ball on the ground. 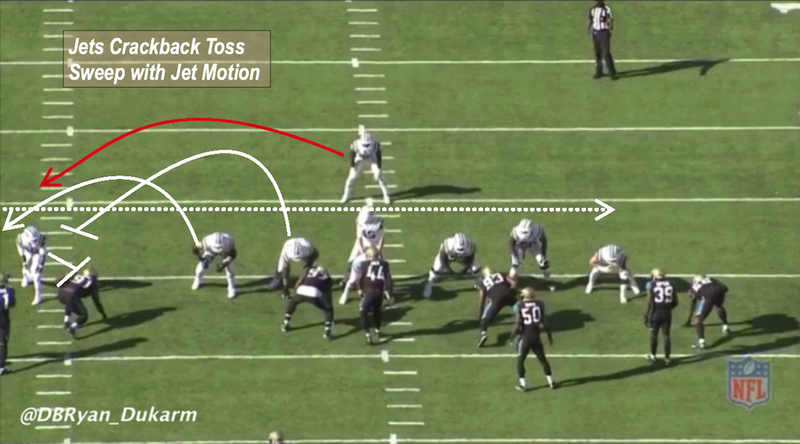 Many teams will mix things up in the run game, but have a base play, be it power, outside zone, or counters. The Jets appear to be a truly multiple team with their blocking schemes, utilizing DUO, sweeps, and outside zone runs consistently. This was a play I noticed most often for the Jets offense. DUO is a power based run scheme that involves two double teams up front on the offensive line, but no pulling offensive linemen. 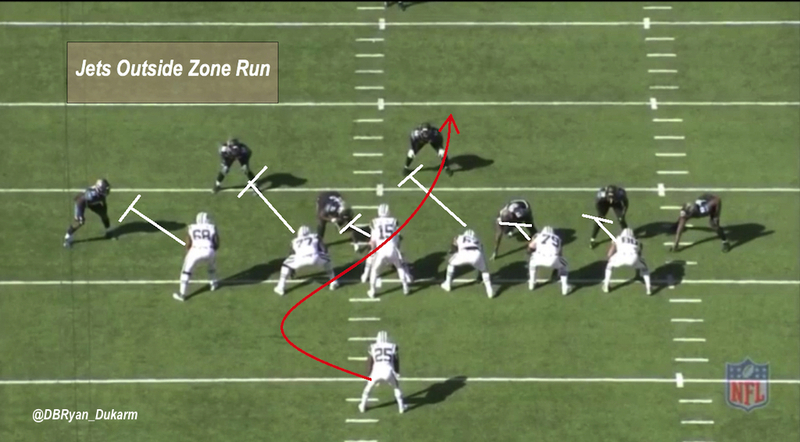 The Jets run this a lot, sometimes adding a lead blocker like a fullback or H-back, sometimes running out singleback sets, and occasionally running it from the shotgun. 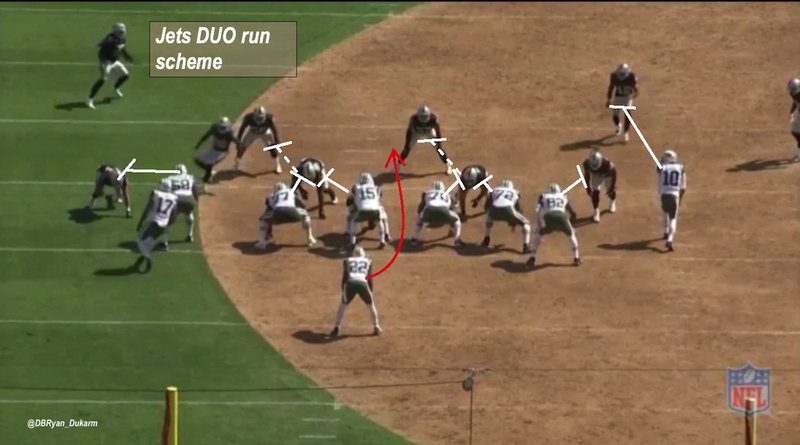 The first example of the Jets running DUO is from their Week 2 game against the Oakland Raiders, a team that runs plenty of DUO themselves. Midway through the second quarter and facing a 1st and 10 near midfield, the Jets will run DUO from 11 personnel. Quarterback Josh McCown (#15) is under center with Matt Forte (#22) behind him, tight end Will Tye (#82) aligned as the right wingback and wide receiver Charone Peake (#17) motioning to the left wingback spot. The Raiders are aligned in a 4-3 over front. The two double teams from the offensive line will take place on the interior. Left guard James Carpenter (#77) and center Wesley Johnson (#76) will double team defensive 1-technique Mario Edwards Jr. (#97). Once they secure the double team, one of them will pass Edwards off to the other and climb to the second level to block a linebacker. The other double team takes place between RG Dakota Dozier (#70) and RT Brandon Shell (#72). They will both block defensive 3-technique Eddie Vanderdoes (#94) and like the previous double team, ideally will be able to secure the DT before climbing to the second level. The play works exactly as designed for New York, with Carpenter and Dozier both climbing to second level to block linebackers Tyrell Adams (#58) and Cory James (#57), respectively. Forte hits the right A-gap with authority, and picks his way forward for a gain of 16 yards. 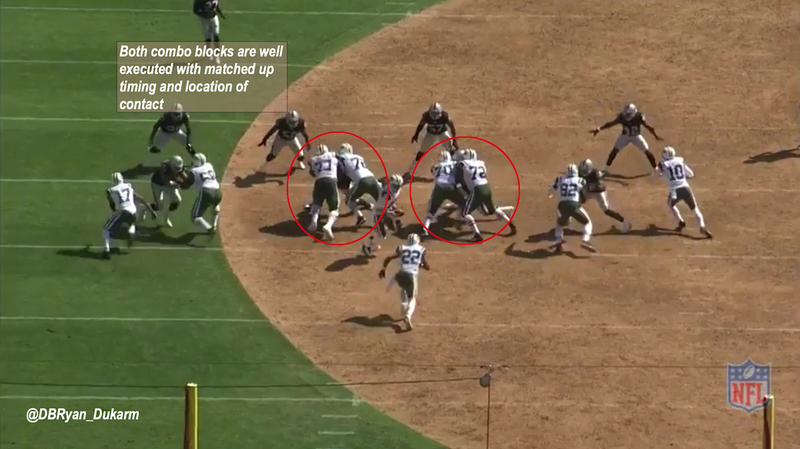 This is a perfect example of how to run DUO, and combo blocks in general, as you can see both pairs of blockers attacking with shoulders and hips aligned, a sign of a well timed and executed double team. The next example of a DUO run is from their Week 3 contest against the Miami Dolphins. 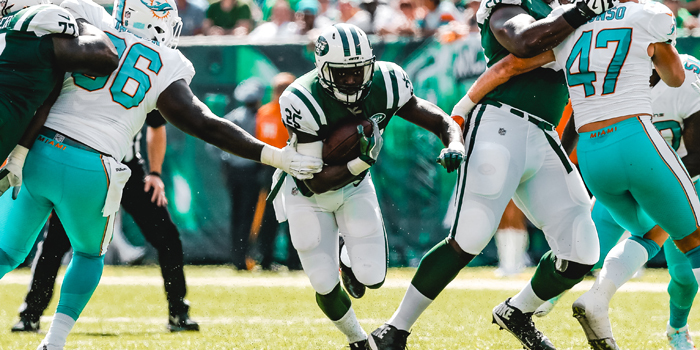 Early in the fourth quarter the Jets will once again run DUO from 11 personnel, though this time McCown and Bilal Powell (#29) are in the shotgun. The design remains the same as from the Oakland game, with doubles from the LG/C and RG/RT. Powell follows the well blocked play into the right A-gap, cutting behind a great second level block from RG Dozier (#70) for a gain of 9 yards. The Jets have also succeeded on outside zone runs this season as well, especially when rookie Elijah McGuire is in the game. The former Louisiana-Lafayette Ragin’ Cajun has the burst and speed to thrive on outside zone runs, and thrive he has. Here, against the Jacksonville Jaguars in Week 4, McGuire will show off his ability on an outside zone run. From 11 personnel, with TE Austin Seferian-Jenkins (#88) aligned to the right of the offensive line, the Jets will run outside zone to the left. The Jets block this play well, with both guards immediately reaching the second level and taking the two linebackers out of the play. The LT and C both stay in front of their men, giving McGuire a clear decision on the play to make the “bang read” and get upfield behind the center. He does exactly that and is off to the races. The final play I wanted to highlight from the Jets’ run game is their crack sweep. It’s another play from 11 personnel against the Jags, this time under center. 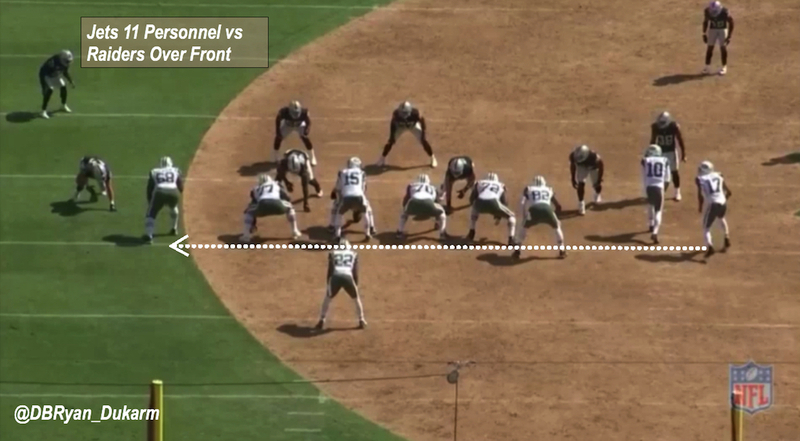 Jeremy Kerley (#14) will come in motion from right to left behind McCown, faking a jet sweep away from the play. The key block will come from slot wide receiver ArDarius Stewart (#18), who will crackback block defensive end Yannick Ngakoue (#91) to prevent him from setting the edge on the toss to McGuire. Additionally, it functions as the “pin” block in a pin-pull scheme for the Jets here, as both RT Brent Qvale (#79) and RG Brian Winters (#67) will pull around Stewart to lead block. Stewart executes the crackback block perfectly, preventing Ngakoue from getting outside. Qvale is able to get out and in front of McGuire, while Winters runs into Stewart/Ngakoue and contains the defensive end rather than leading for McGuire. So, the Jets aren’t as helpless as people thought they’d be. They’re running the ball incredibly well, and the best part about it is that they have a multitude of plays to attack individual teams. 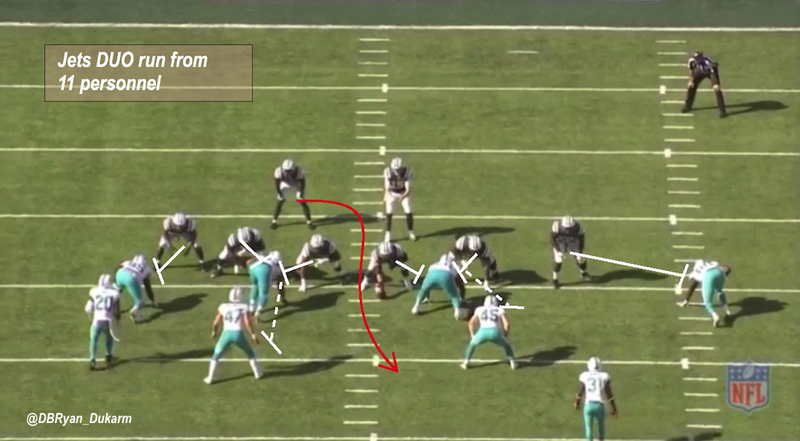 They ran more DUO against the Dolphins, and focused more on getting blockers flowing on zone runs against the Jaguars. However they decide to do it, the Jets can run the ball. Follow Ryan on Twitter @DBRyan_Dukarm. Check out the rest of his work here, including his look at Oregon’s curl-post passing concept, the variations of the HOSS concept that USC and Sam Darnold use, and his study of what effect making a pre-draft visit has on being drafted.